Since my DRZ will be seeing a mix of pavement and off road, a change of gearing is necessary from the dirt oriented gearing on the stock DRZ400E. As stated previously in my blog, the DRZ-E has a stock gearing of 14-47. This means the front sprocket has 14 teeth on it and the rear sprocket has 47 teeth on it. Increasing or decreasing the number of teeth will change the speed at a given RPM. Moving one up in teeth is the equivalent in moving the other down in teeth, but at different rates. There's all sorts of calculators and charts online to tell you what you need to have. 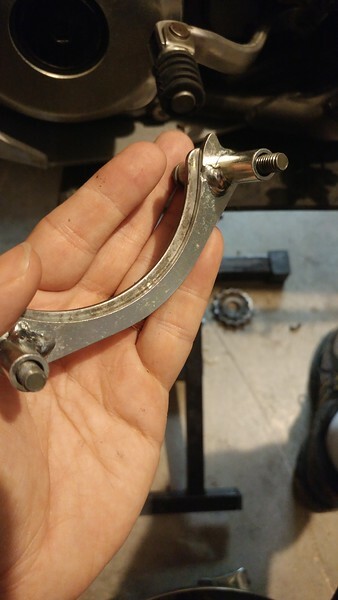 In addition, one thing to keep in mind is that making gearing changes can require either a longer or shorter chain if you make your changes too big. The front sprocket is an easy place to start with. First, one tooth on the front equals about three on the back, so you can make bigger changes here without affecting chain length too much. Also, front sprockets are much cheaper than rear sprockets. It's good to replace both sprockets and chain together but I'm testing to see what I like before making that big commitment. 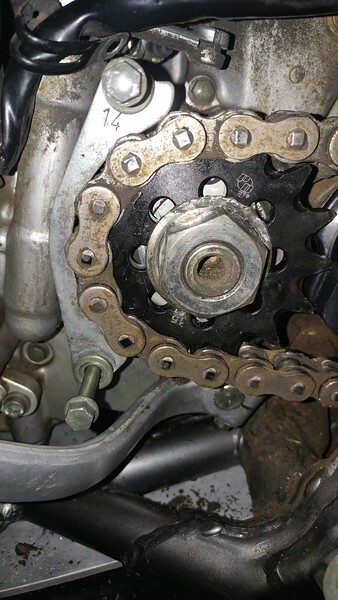 Also, going smaller on the front sprocket makes the chain turn tighter and can result in increased chain wear. I want to go larger, but there's clearance issues to contend with depending on how big you go. This will come into play later. The E model comes with a 14 tooth front sprocket but the street model S comes with a 15 tooth sprocket. This makes the move to a 15 a no brainer here to increase the streetability of the motorcycle. 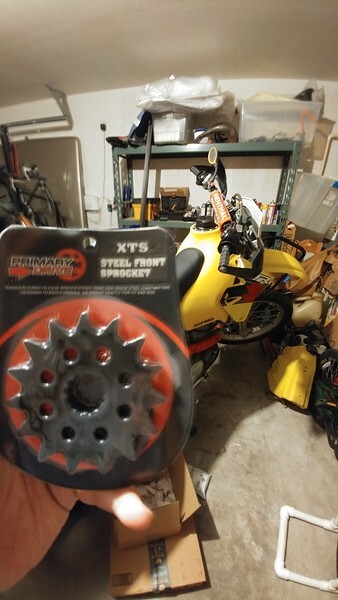 A little over ten bucks scores me a new front sprocket. 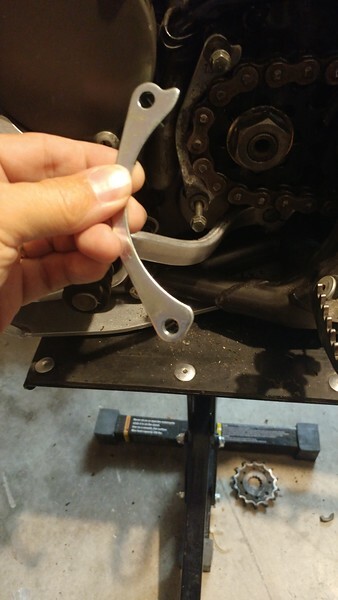 I for some reason didn't take pictures, but the primary purpose of all of this was to replace the chain buffer on the swingarm. This is a hard rubber piece that goes around the top, bottom and front of the swingarm that the chain slides along. The one on this bike was old and brittle and most of it was missing. Without this, the chain drags on the swingarm and can put a hole in it. Replacing it requires removing the front sprocket so this was a good time to fiddle with gearing. Sprocket off and buffer changed I installed the new sprocket. Remember what I said about clearance before? You'll notice in the photo below the metal part that is installed in front of (to the left of in the photo) the sprocket. This is in case your chain breaks it doesn't sling around and put a hole in your cases or your foot. Notice the "14" stamped into it. I presume that means it is for a 14 tooth sprocket. Sure enough, with the 15 tooth sprocket installed there's a little rubbing. A quick search online finds that a little grinding will take care of that. However, I remember that the DRZ-S comes with a 15 which means this part for the S model must be different. I check the online fiche's and find that there are two different part numbers. The part is about $10 so it won't break the bank and would be the correct tool for the job instead of grinding the 14 tooth guard down, so I order it. Here you see the "S" guard with the E guard installed behind it. Placing them back to back with the bolts through them shows the shape is the same, but the placement of the bolt holes is different between the parts, thus moving the guard forward for the S model. The new part fit in just like I expected and I got it buttoned up and taken for a quick shakedown ride. I'll have to wait for a longer ride to see how it feels with the gearing but everything was working properly related to the new gearing.